Need a gift for referral partners or at each place setting at an event? 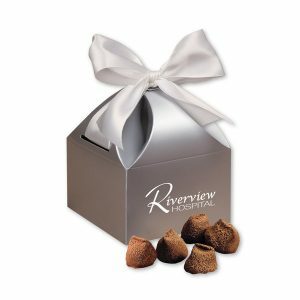 Truffles in a beautiful gift box with your logo is the answer. Crafted in the centuries-old tradition of Europe’s finest chocolatiers, these rich, creamy truffles offer the ultimate in chocolate enjoyment. Each decadent center is carefully blended for supreme smoothness, then gently dusted with premium cocoa to create a soft, sophisticated finish. Your choice of copper, silver, or robin’s egg blue gift box is foil-stamped with your logo and tied with a matching satin ribbon and bow. Each box contains 11 truffles. 24 box min. Price for 24-95 is 14.99 ea, 96-479 is 14.95 ea, 480-959 is 14.95 ea. $50 set up. Imprint area is 2″ x 1-1/2″. Special free ground shipping on select items to 48 contiguous states (not the chocolate truffles below). Go to https://mapleridge.com/free-shipping to see the choices with free shipping on orders placed by 11-16-17.